Today’s report from the Census Bureau on the diversifying American electorate in 2012 confirms an historic turnout milestone first noted last December by the Pew Research Center, but undercuts a number of other widely-reported demographic analyses of last year’s presidential vote. 1. For the first time ever, the black voter turnout rate in a presidential election exceeded the white voter turnout rate—66.2% versus 64.1%. 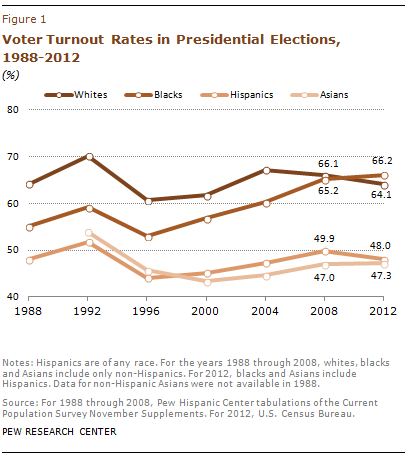 While the presence of Barack Obama on the ballot in 2008 and 2012 no doubt contributed to the narrowing and reversal of what had been a longstanding black-white turnout gap, the rise in the black turnout rate pre-dates his candidacies, as the chart to the right illustrates. 2. Hispanics continue to punch below their weight. Much was made right after the November election about the clout of the Hispanic vote (by, among others, the Pew Research Center). But the new Census Bureau data show that Hispanics’ turnout rate—just 48%—was far below that of whites (64.1%) or blacks (66.2%). It also fell nearly two percentage points below the Hispanic turnout rate in 2008, which was 49.9%. 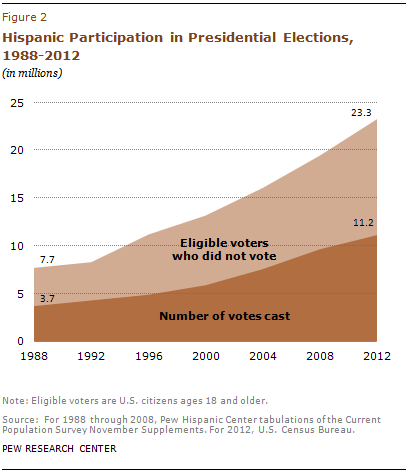 Because of population growth, the number of Latinos who voted for president increased by about 1.4 million from 2008 to 2012, to a record 11.2 million, but the number of Latinos who were eligible but chose not to vote increased even more—by 2.3 million—from 9.8 million in 2008 to 12.1 million in 2012. 3. Youth voter turnout rates also declined from 2008 to 2012, contrary to initial reports based on the national Election Day exit polls, which had shown the youth voter turnout rate holding steady. 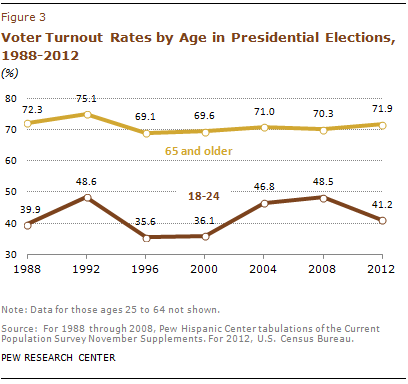 According to the Census Bureau report, the turnout rate among 18-to 24-year olds fell to 41.2% in 2012 from 48.5% in 2008. (Most of the post-election analysis of the youth vote focused on 18- to 29-year-olds and showed no change in voter turnout rates between 2008 and 2012; the Census Bureau report only provides an analysis for those ages 18 to 24 years.) The turnout rates of adults ages 65 and older rose—to 71.9% in 2012 from 70.3% in 2008, according to the Census Bureau report. 4. Despite the low turnout rates for Hispanics, their high share of the under 18 population of the U.S. means that, by dint of generational replacement, they will become a more important voting bloc in future elections. Hispanics are 17% of the total U.S. population, but 24% of the under 18 population. Each year, an estimated 800,000 Latino youths turn 18. The overwhelming share is U.S-born citizens, and thus automatically eligible to vote once they enter adulthood. 5. Likewise, the so-called Millennial generation (adults, born after 1980, who are now ages 18 to 33) is certain to become a growing share of the electorate. Today they are 25.5% of the age-eligible electorate. By 2020, they will be 36.5%. If history is a guide, this cohort of voters will increase its voter participation levels as it grows older. The gap between the voter turnout reported by the Census Bureau and the actual national vote tallied by election officials widened in 2012. 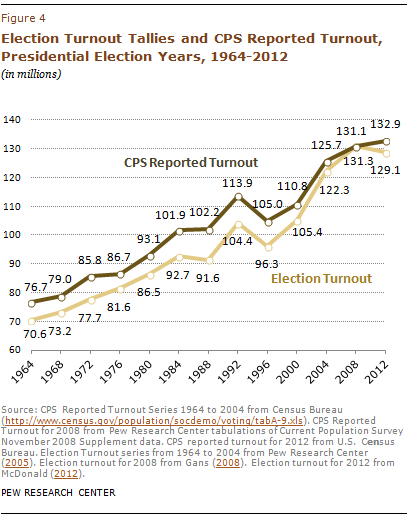 According to the Census Bureau’s 2012 Current Population Survey November Supplement on Voting and Registration, an estimated 133 million U.S. citizens voted in 2012. That estimate is higher—by 4 million votes—than the national tally of 129 million votes cast for president. The gap in reported votes and the actual vote tally is the widest since 2000 (when the gap was 5.4 million votes) and marks the first widening of the gap since 1984. The Census Bureau’s November supplement to the CPS is the most comprehensive data source available for examining the demographic composition of the electorate in federal elections, but it relies on a post-election self-reporting by survey respondents. Because of what is sometimes described as “social desirability bias” some survey respondents may say they voted when in fact they did not. Paul Taylor is the author of The Next America and the former executive vice president of Pew Research Center.